Just because your average house guest might not see your master bathroom doesn’t mean you should neglect that remodeling job. By its very nature of being connected to the master bedroom, the master bath is an important part of your home. A professionally renovated bathroom remodeling job can liven up your living space and help you feel more at home. Even if you plan on staying in your current home for many years, keeping the future in mind is important. Remodeling your master bathroom can help increase the overall resale value of your home. Because of this, it’s important to keep future buyers in mind when remodeling your bathroom. This means installing sinks, toilets and bath fixtures at standard heights. Your professional contractor can help you decide where to put these items when completing your remodeling project. 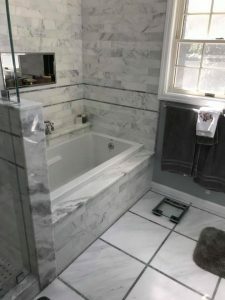 Another way your professional contractor can help you get the most out of your bathroom remodeling project is to make better use of existing space. Bathrooms, even master bathrooms, tend to be small. A professional contractor can advise you how to utilize this space and make rooms appear larger than they otherwise would appear. Using your square footage efficiently is also important due to the location of water hookups and existing plumbing. Remodeling your master bath isn’t just about making the space look updated. It’s also an opportunity to make changes to the existing plumbing. During this time, you can fix problems with your current plumbing, and you can also install water and energy-efficient fixtures. Bathrooms can use a considerable amount of water, and installing environmentally friendly fixtures to your bathroom could save you money on your utilities in addition to cutting down on water usage. Getting the most out of your bathroom remodeling project doesn’t have to be a stressful process. Hiring a professional for the job can help you revamp your bathroom into a space you’ll be happy to have as part of your home.